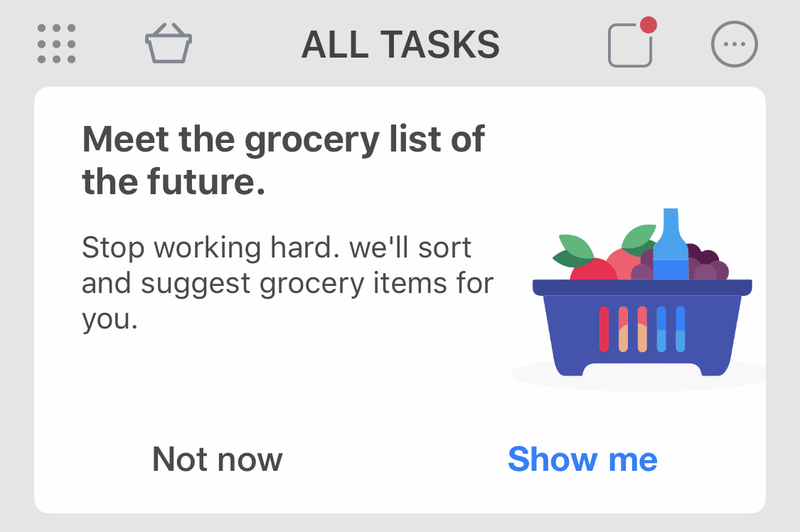 iOS: There are so many task management apps out there that picking the perfect one for you is a task in itself—one you’ll likely want to track on a to-do list or, honestly, a huge spreadsheet. 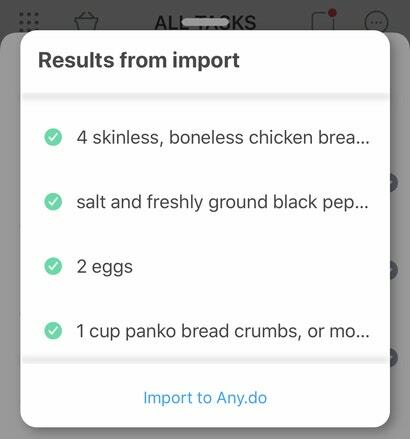 However, if you’re the one always stuck buying the groceries in your household, a brand-new feature you’ll find in Any.do’s app might bump it up to the top of your (app) shopping list. 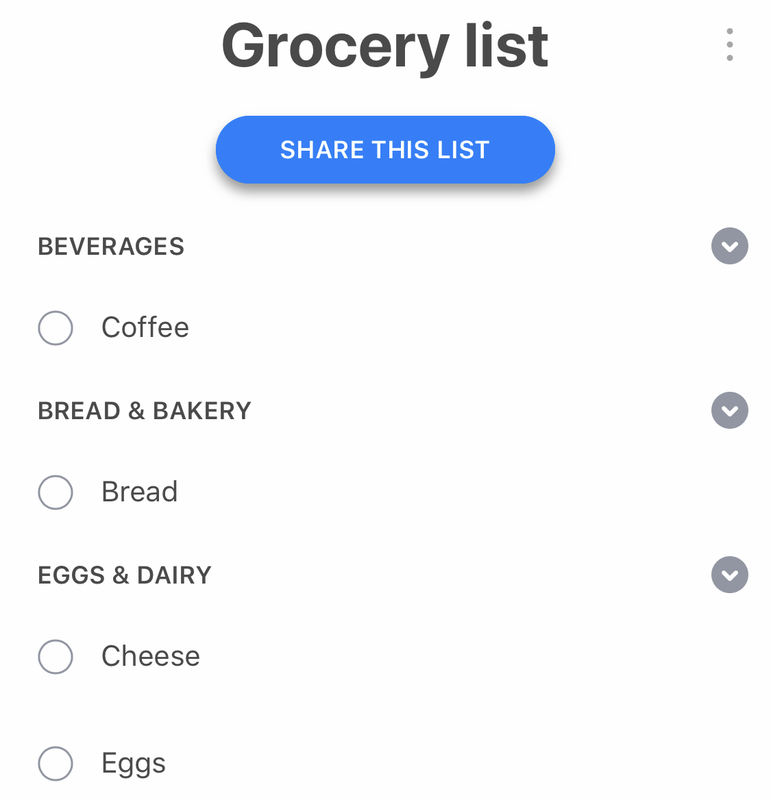 Before I show off the Any.do’s awesome new shopping list feature, I have one quick note. You’ll only be able to find it on the iOS version of any.do’s app for now. Android support “is already being worked on,“ the company says, and a web-based version of the tool will eventually arrive at some point. In my opinion, it’s worth waiting for. Tap it, and you’ll be prompted to “Meet the grocery list of the future,” if you’re checking out this feature for the first time. Tap on “Show me” to get started, and here’s where it gets fun. You’ll see a little text input that comes pre-populated with some standard items you might want to get at the store: milk, eggs, bread, butter, et cetera. You can also enter in your own grocery requests—and feel free to get specific when you do. I was pleased to see that any.do correctly auto-suggested “Haribo gummi bears” after I typed in only the first few letters of “Haribo.” Whatever your needs, tap on the items as they pop up to quickly add them to your shopping list. 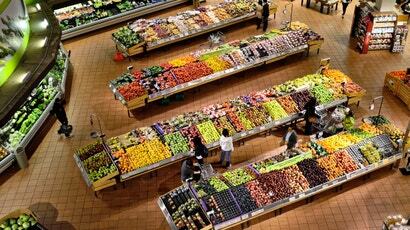 Only, you aren’t adding that-which-you-need-to-buy to one mega shopping list, like most task management apps. Instead, Any.do automatically sorts your items by category. That means that when it’s time to go shopping at the store, you won’t have to run back to the “fruits/vegetables” aisle when you get to the bottom of your list and realise you forgot the canned peas. It’s an incredibly handy feature that works pretty well—at least, the app correctly sorted everything on my not-so-insignificant shopping list. 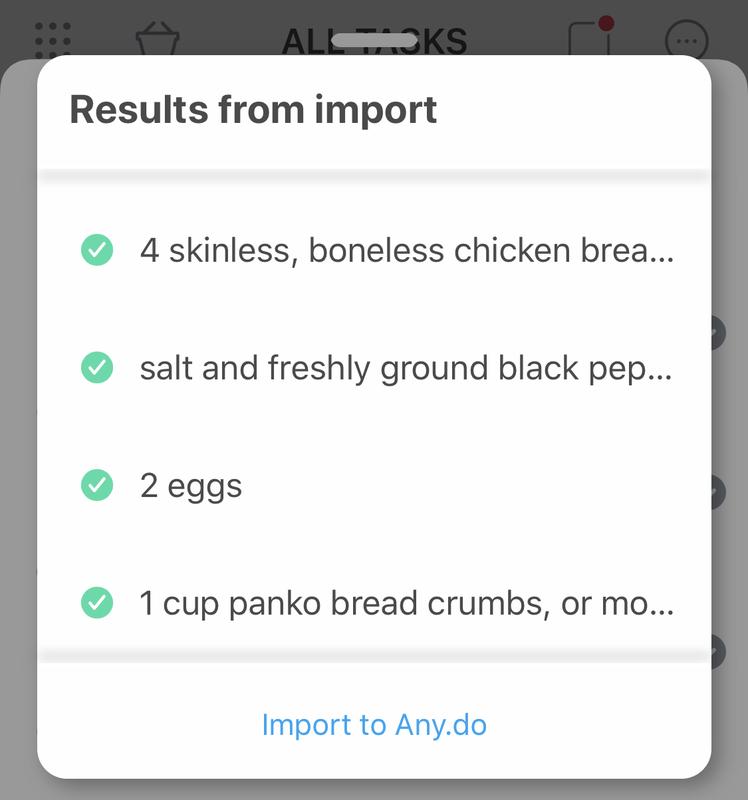 You can also import items to your grocery list from your device’s clipboard. It’s useful if you’re looking to get exactly what you need for a specific recipe. I did find that recipes that add a measurement before items’ names—“1/4 cup prepared tomato sauce,” for example—confused Any.do’s sorting mechanism, which means the item got dumped into a catch-all “others” category. Once I renamed the item to just “tomato sauce,” the app correctly sorted it into a “Pantry” category. Any.do makes it easy to create collaborative lists with others, like your roommates or family members. They’ll need their own Any.do accounts, of course, but then you’ll all be able to contribute to the same shopping list. I recommend creating different shopping lists for every major store everyone needs to visit, like separate “Trader Joe’s” and “Whole Foods” shopping list, just so you don’t get confused about what you should buy where (if you’re picky). And while you can’t assign items to specific people you’ve shared a list with (if only! ), at least this prevents everyone from buying a loaf of bread on the way home when you only need one. Or if you want a free simple app that does what it needs or do without sharing your data with the developer (although you can share your list between devices with Dropbox) try ShopShop for iOS.